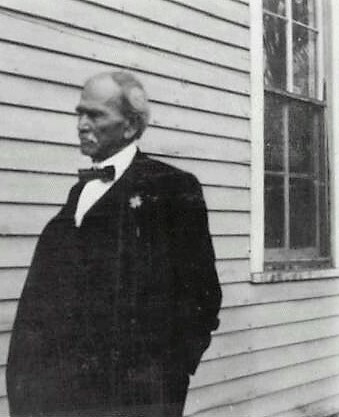 James Hutto was born May 8, 1824 to John and Nancy Holliday Hutto in Greenville, South Carolina. When he was a young boy, the family moved to Alabama and he stayed there until he was 22 years old. At that time he came with a group of people to Texas, arriving in the promising new state on January 16, 1847. At first, Hutto lived near Austin. He partnered with George Glassock on the first grist mill in Georgetown and was a founding citizen of the town. Brother Hutto moved his family to the future townsite of Hutto in 1854. By this point, he had already become a successful cattle rancher but his success grew at his new home and he quickly became a leading cattleman in central Texas. Around the same time, he joined Post Oak Island Masonic Lodge #181. In 1876, the railroad arrived and Brother Hutto sold fifty acres of land to the rail company with stipulations that a few acres be used as the site of a new town. One year late, a post office was established and Hutto became the postmaster. In 1885, he left his land and his cattle business to move to Waco where he started a hardware store and affiliated with Waco Lodge #92. The store sold many things including farm wagons and was located at 110 South 8th street. James Hutto died in April of 1914.